The information kiosk in Harvard Square	answers questions, and sells good maps and walking tour guides to the area. 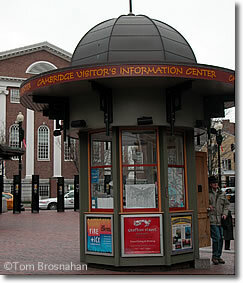 The Cambridge Visitor's Information Center is an information booth in the center of Harvard Square (map), right next to the entrance to the Red Line's Harvard Square subway station, and across Massachusetts Avenue from the Harvard Cooperative Society store ("Harvard Coop"). The booth is open Monday through Saturday from 9 am to 6 pm and on Sunday from 1 to 5 pm. They sell good maps of the Harvard Square area and walking tour guides for a small charge. They'll also answer any questions you may have about the Harvard Square area. Here's information about visiting the Massachusetts Institute of Technology. Cambridge Visitor's Information Center, Harvard Square, Cambridge MA.